Indonesia has so many traditional textile. After Batik as Indonesia National Heritage, now Tenun Ikat Indonesia will be pop in fashion world. Didiet Maulana one of young designer who brings the tenun ikat into the high level with his collections. Tenun Ikat Indonesia also seen in many fashion weeks like Jakarta Fashion Week, Indonesia Fashion Week and Jogja Fashion Week. Tenun Ikat will be coloured a fashion world with their unique colours and motives. I've been searching for the Ikat pants that suit with my personal style. And i found this pants in Goman Store. I want to make a casual style with this ikat pants and give a simple-modern touch in this look. So i pair the pants with white t-shirt, black cardigan and give a chic touch on the belt. Or you can match the pants with a white shirt or polo-shirt if you want to looks preppy-smart casual. .T-shirt : Parachute, Tenun Ikat Pants : Goman Store, Black Cardigan, Belt : Haru Haru Man, Satchel Bag, White Shoes : Unbranded. 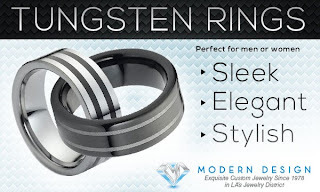 Experience the sleekness and versatility of tungsten rings at Modern Design Inc.